For the sources used in this article's, click here. No, it's not ISIS or rampaging Shi'i militias. It's the Mosul Dam, Iraq's largest, and its possible collapse, perhaps leading to millions of deaths. Those in the know worry catastrophe could strike this spring, as snows melt and build an uncontrollable water pressure. The Mosul Dam from the air. Hastily built in wartime for the dictator Saddam Hussein by a German-Italian consortium, the Mosul Dam was located where it is because one of Hussein's cronies came from the area and used his pull, despite the fact that engineers knew from the start that its porous gypsum base could not sustain such a huge structure. What was then called the Saddam Dam opened in 1984 and within two years needed constant grouting, that is, day and night infusions of microfine cement, lots of it – 200 million pounds over the decades – to keep it from collapsing. The grouting keeps the foundational problem from worsening but does not solve it. Employees at work to strengthen the Mosul Dam, Feb. 3, 2016. The years went by; fortunately, there was no disaster on the American watch. 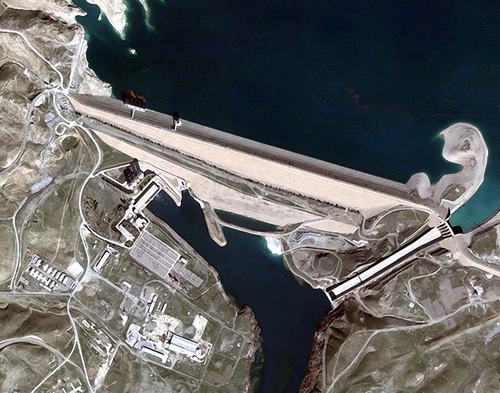 Then, during a fateful ten-day period, August 7-17, 2014, the Islamic State (ISIS) seized control of the dam. While the group neither sabotaged nor blew up the structure, grouting stopped for six weeks and the whole repair regime – especially the skilled workers and the supply of cement – henceforth became less consistent. As a result, the dam has steadily weakened over the past 19 months, to the point that experts worry that a surge of spring waters will overwhelm it and cause its collapse. That the dam's two emergency floodgates are broken and cannot be opened to relieve intense pressure renders the situation the more fraught. The consequences of a collapse are terrifying: A wall of water 45-70 feet high would reach Mosul, a city of some one million inhabitants, in about four hours. Then the flood wave would roll down the Tigris River valley to other cities, including the capital Baghdad, before dispersing in a wide flood. A huge number of immediate casualties would be followed by drought, disease, lack of electricity, chaos, and crime, ensuring biblical-level miseries and fatalities. For years, quiet grouting and blithe assurances kept the precariousness of the Mosul Dam obscure. But heightened alarms coming from the U.S. government since the start of 2016, relying primarily on U.S. Army Corps of Engineers estimates, appear finally to have awakened Iraqis to the dangers they face. The U.S. embassy in Baghdad has even issued a highly unusual "Mosul Dam Preparedness Fact Sheet" with advice (in English, alas) on evacuation steps, educational needs, and relief efforts. In contrast, the Iraqi government issues a stream of dishonest assurances that there's no problem. Mohsen al-Shimari, Iraq's minister for Water Resources and official in charge of the dam, says "The danger is not imminent, it's far off. The danger is 1 in 1,000" (itself, an unacceptable risk). Or he insists that Mosul Dam is in "no greater" danger than other dams. At other times he actually claims "there is no problem in the dam that may lead to its collapse." Note the inconsistency, itself a sign of duplicity. In keeping with this irresponsible, even criminal nonchalance, Iraqi authorities have done next to nothing to prepare for a possible collapse. Yes, they claim that a contingency plan exists, but no one has seen it, much less learned its details, so what use can it have in time of crisis? 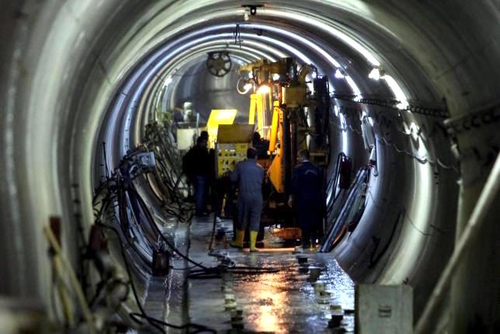 Yes, they signed a $300 million deal with Trevi, an Italian company, to repair and maintain the Dam, but this is a Band-Aid fix, not a long-term solution. To make matters worse, the dam's most vulnerable city, Mosul, labors under the rule of the apocalyptic Islamic State, whose disregard for human life and extreme hostility toward the outside world negates both crisis planning and international assistance. But there is a silver lining here; ISIS' monstrous rule has caused Mosul's population to decline from 2½ million two years ago to about 1 million now, thereby reducing the number of potential casualties there. Assuming the dam survives this year's snow melt, only one long-term solution exists: to complete the Badush Dam downstream from the Mosul Dam that would mitigate the consequences of a collapse. Started soon after the grouting began in 1986 but halted in 1990, this ancillary dam will cost US$10 billion that the Iraqi government cannot afford. But it must be the country's highest priority. Will ISIS Create an Artificial Drought in Iraq?